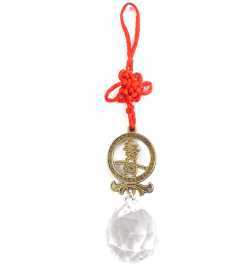 The feng shui crystal: a crystal ball with a lucky coin and a red Chinese knot on top. It has very good meanings. We can hang the crystal ball in the North East, North, and South East windows to bring in the sun, and reflect the beautiful rainbow into your office or home.